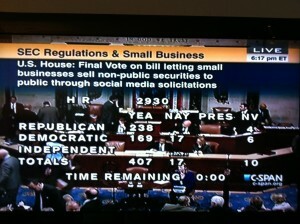 Washington, DC – The Startup Exemption and Small Business & Entrepreneurship Council (SBE Council) announced today they will hold an event to call attention to the need for the U.S. Senate and U.S. Securities and Exchange Commission (SEC) to act on a common sense proposal that would permit crowdfund investing. The rally coincides with Global Entrepreneurship Week and the SEC’s annual meeting on small business capital formation on November 17th. The event will be held on the Capitol grounds between Union Station and the Capitol building at 8:00 a.m. True to the tenants of crowdfunding, the group is crowdfunding the costs of the event with a pitch on IndieGoGo. 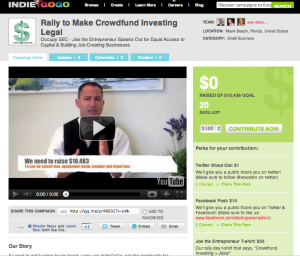 Crowdfund Investing (CFI) builds on the tenants of crowdfunding. While in traditional crowdfunding, a group of individuals “donate” small amounts of money to an idea (for example, an art related project). In CFI, individuals use small amounts of money to buy equity in a business. The goal of CFI is to provide entrepreneurs and small businesses with access to capital that they will use to grow and hire. Individuals are motivated to invest by the desire to support an entrepreneur and her business plan, to be a part of the solution to our economic woes, and for a potential financial return. 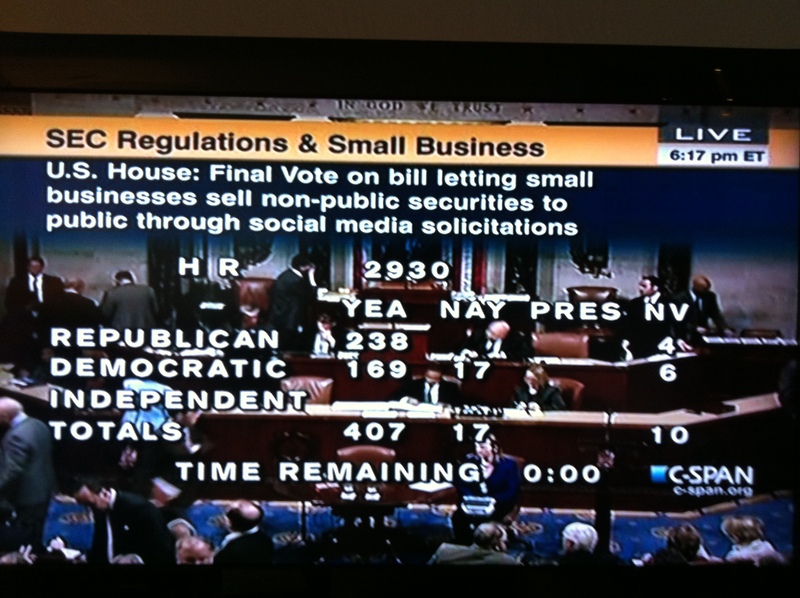 SBE Council President & CEO Karen Kerrigan observed that the quick pace of the crowdfund investing bill demonstrates that members of both political parties understand capital access is a critical issue for both entrepreneurs and our nation’s economic recovery. “Crowd fund investing will give small business owners and entrepreneurs access to sources of capital they currently cannot tap into without triggering complex SEC rules. With common sense reforms, more Americans will be able to invest in promising small businesses, which means more jobs and greater economic growth. Reformulating outdated rules while maintaining investor protections will help entrepreneurs identify and connect with potential funders,” said Kerrigan. Crowdfunding has grown in popularity over the past 5 years with millions of participants around the world. Entrepreneurs see CFI as a way to raise moderate amounts of capital and investors see it as a way to help entrepreneurs in their community. 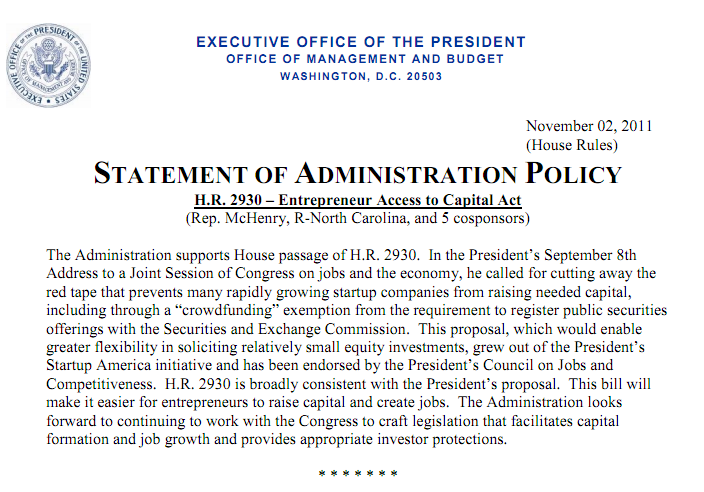 Numerous academic reports discuss how SEC rules block small business’ access to capital. SEC-registered Crowdfund Investing websites will provide the platform for investors to analyze ideas and self-select those community entrepreneurs they wish to support. According to H.R. 2930, only businesses that reach their funding target will be funded, entrepreneurs cannot raise more than $2M and investors are limited on how much they can invest. The SEC would continue to provide prudent oversight to CFI to mitigate the risk of fraud and protect investors. About STARTUP EXEMPTION: Startup Exemption is an initiative spearheaded by Sherwood Neiss, Jason Best and Zak Cassady-Dorion. Mr. Neiss, a 3-time INC500 entrepreneur, came across the problem when trying to help crowdfund two of his startups. While discussing it with Mr. Best, a 2-time Inc 500 entrepreneur, lawyers made it clear that the rules for raising capital were arcane, complicated and required costly compliance measures. Understanding the critical importance of startup capital, these three colleagues set about changing the regulations for investing in Startups. Their goal is to add an exemption to the Securities & Exchange laws based on Crowdfund Investing aka equity-based crowdfunding. 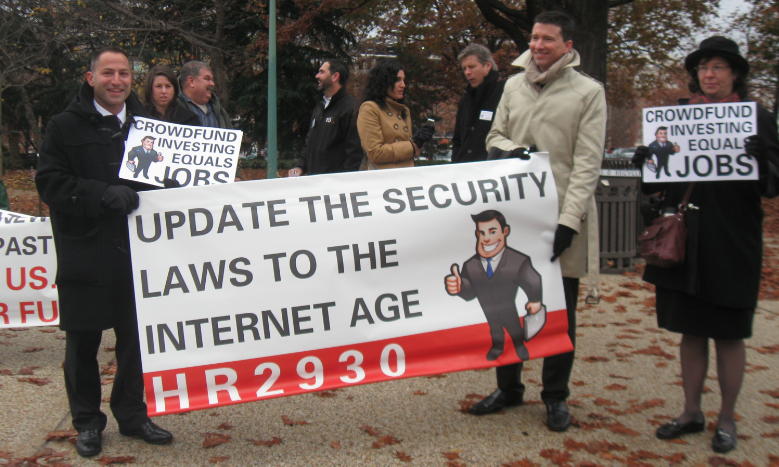 Online petition and more information can be found at: http://www.startupexemption.com/. SBE Council is a nonprofit, nonpartisan advocacy, research and training organization dedicated to protecting small business and promoting entrepreneurship. For more information, please visit http://www.sbecouncil.org/.